With hindsight, we tend to exaggerate what we had known with foresight. This phenomenon can be observed in a memory design in which previous judgements have to be recalled after outcome information has been made available, or in a hypothetical design in which participants receive outcome information but are asked to ignore it when subsequently judging what they would have said without this information. Since the introduction of this so-called hindsight bias or knew-it-all-along effect to the psychological literature in the mid-seventies, there has been immense research on this topic. This special issue presents ten articles that describe the most recent theoretical developments and empirical results. After a brief introductory overview of the state of the art, the issue commences with two process models (SARA, Pohl, Eisenhauer & Hardt; and RAFT, Hertwig, Fanselow & Hoffrage), which are formalized enough to allow for computer simulations. Subsequently, Hardt and Pohl demonstrate how the hindsight bias is related to the phenomenon of anchoring, and Schwarz and Stahlberg propose that due to meta-cognitive processes, the outcome information is deliberately chosen as such an anchor. In a variant of the meta-cognitive approach, Werth and Strack argue that ease of retrieval of an answer is used as a cue to infer its correctness and to determine one's confidence in its correctness. Similarly, Pezzo proposes a model that predicts hindsight bias from feelings that arise when trying to make sense of the outcome information in light of prior expectations. Mark et al. and Renner adopt a motivational perspective and explore the impact of self-relevance of the outcome information. 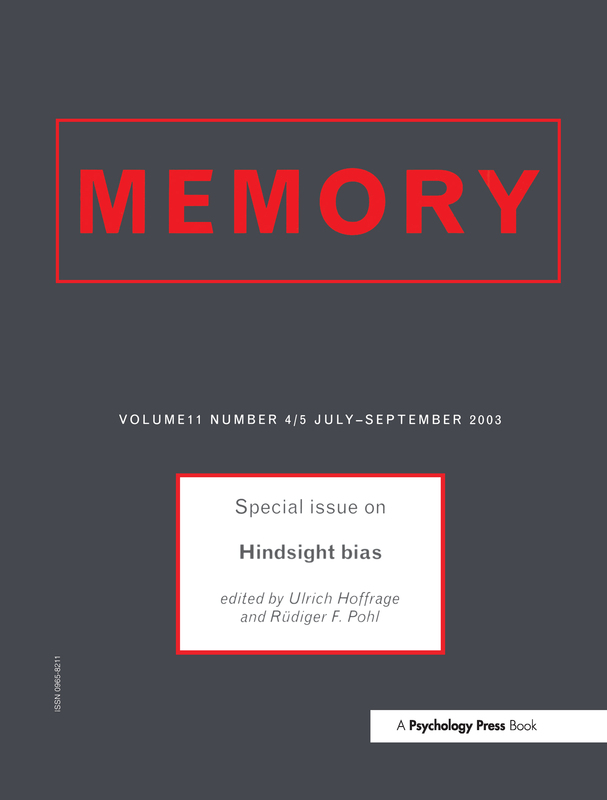 Blank, Fischer, and Erdfelder report a successful replication of the hindsight bias in two political elections, and Musch explains some of the variance in hindsight bias using personality factors. U. Hoffrage, R.F. Pohl, Introduction. R.F. Pohl, M. Eisenhauer, O. Hardt, SARA - A Cognitive Process Model to Simulate the Anchoring Effect and Hindsight Bias. R. Hertwig, C. Fanselow, U. Hoffrage, Hindsight Bias: How Knowledge and Heuristics Affect Our Reconstruction of the Past. O. Hardt, R.F. Pohl, Hindsight Bias as a Function of Anchor Distance and Anchor Plausibility. S. Schwarz, D. Stahlberg, Strength of the Hindsight Bias as a Consequence of Meta-cognitions. L. Werth, F. Strack, An Inferential Approach to the Knew-it-all-along Phenomenon. M.V. Pezzo, Surprise, Defence, or Making Sense: What Removes the Hindsight Bias? M.M. Mark, R. Reiter, K.M. Eyssell, L.L. Cohen, S. Mellor, "I Couldn't Have Seen it Coming": The Impact of Negative Self-relevant Outcomes on Retrospections about Foreseeability. B. Renner, Hindsight Bias after Receiving Self-relevant Health-risk Information: A Motivational Perspective. H. Blank, V. Fischer, E. Erdfelder, Hindsight Bias in Political Elections. J. Musch, Personality Differences in Hindsight Bias.